THE foundation stone for a sports complex, auditorium and BDA complex at OMBR Layout will be laid next month, said Bengaluru Development Minister K J George. BENGALURU: THE foundation stone for a sports complex, auditorium and BDA complex at OMBR Layout will be laid next month, said Bengaluru Development Minister K J George. The minister also lauded BDA for not merely developing sites and building flats but also creating flyovers, parks and developing lakes within its own budgetary resources. Thirty different species of tree saplings have been planted here, he said. “The need for such an amenity was demanded by the public repeatedly during grievances meets organised by the BDA,” Prakash said. 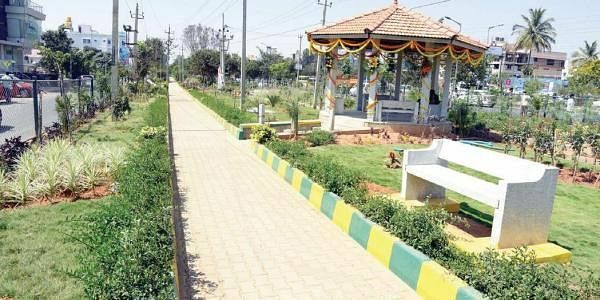 “The boulevard also has two gazebos (umbrella-shaped stone shelters) under which senior citizens can take rest or yoga practitioners can practise their asanas,” he added.